AUD100 Series Ultraviolet Flame Detector. The AUD100 series advanced ultraviolet flame detector socket for the AUD15 tube unit consists of dedicated sockets designed to monitor batch operation oil or gas burner combustion by detecting ultraviolet light emitted with the AUD15 tube unit. 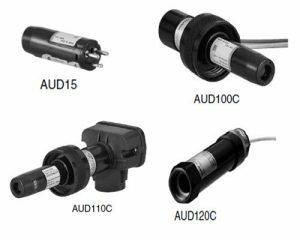 Three models are available to meet wiring and installation requirements: the AUD100C lead-wire model, the AUD110C terminal block model, and the AUD120C slim model.